Get what you want, every time! Imagine a world where you are offered every job you seek; every business venture you undertake is successful; and every potential customer you approach buys your product. Now imagine that all of this can be achieved—ethically and honestly. 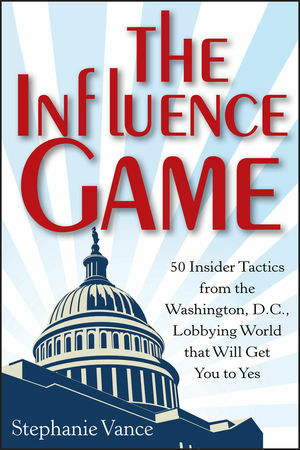 All you need is the help of one battle-tested guide, The Influence Game. Former Washington, D.C. lobbyist Stephanie Vance dispenses everything she's learned about effective (and, believe it or not, honest) persuasion. Learn how to apply this power to any situation by using D.C. insider influence strategies and applying a step-by-step, easy-to-understand process for success. Stephanie Vance has seen the influence game from every angle. Follow her lead to get past being heard to the real goal of being agreed with. Stephanie Vance spent decades as a D.C.-based lobbyist, congressional aide, speaker, and grassroots consultant. A sought-after speaker with more than 50 engagements per year, Stephanie, known as the "Advocacy Guru," has trained thousands of people in hundreds of organizations, including the National Association of REALTORS®, the Lance Armstrong Foundation, the Humane Society of the United States, and the American Library Association. As a member of the National Speakers Association, Stephanie has earned her Certified Speaking Professional (CSP) designation, an honor held by less than 10 percent of speakers in the world. She is the cofounder of Advocacy Associates, a D.C.-based consulting firm. Stephanie teaches lobbyists how to lobby on behalf of the American League of Lobbyists.